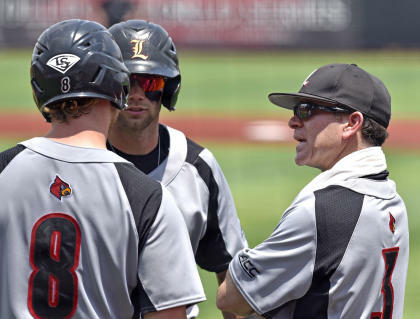 On Wednesday, the University of Louisville agreed to pay its baseball coach $1 million per year. (Repeat: baseball.) With various bonuses, Dan McDonnell's annual compensation can actually go even higher than that. He is believed to be among, if not the, highest paid baseball coach in the country. There was some howling over the idea of a college baseball coach breaking into the million-dollar club. This was misplaced. This is America and this is capitalism and McDonnell is worth whatever he can get someone to pay him. Good for him. And Louisville can decide whatever it wants to pay its employees. Good for it. The more germane point is this: while eye-popping coaches' salaries are nothing new in football and men's basketball, as uneasy as it is seeing millions go to them and "just" full scholarships to the players, in college baseball that isn't even the case. Louisville, for instance, lists 38 players on its baseball roster, 30 of which have appeared regularly in games this season. However, NCAA rules say Louisville can only offer 11.7 scholarships. Part of McDonnell's job is divvying up a pool of money that covers less than 30 percent of what would be needed for every player to get a full ride. Alabama football coach Nick Saban may be making over $7 million per year, and his players deserve a larger share of the revenue they produce (namely via profits off their name and likeness). Eighty-five of them, more than enough to field a football team (the NFL roster limit is 53), get full rides, though. The disparity in so-called non-revenue sports is disturbing, especially as coaches are valued above seven-figures annually and games are blanketed over ESPN and conference cable television networks. It also illustrates the tortured economic logic that college sports employs. It is half Marxism, half capitalism … only the half of each that it subscribes to always wind up benefiting coaches and administrators over the athletes and their families. There are three main excuses offered as to why baseball (and other Olympic sports from golf to gymnastics to soccer to lacrosse) scholarships are limited well below full roster: cost, so-called competitive balance and in the case of men's sports, compliance with Title IX, a federal law that requires an equal number of athletic scholarships for men and women. Since there is no female equivalent to football (and its 85 scholarships) other men's sports need to be limited in an effort to bridge the gap. This is a cop-out, of course. Softball, like baseball, has grown in popularity, yet the NCAA allows just 12 scholarships, or just 0.3 more than baseball. That still doesn't come close to covering a full roster, which typically has two-dozen or more players. If Title IX is a big deal, then why not double up for the women rather than starve everyone? As for costs, major programs are rich in revenue, hence the soaring coaches' salaries, staffing increases and so on. To say there isn't money is absurd. Just look around. There is enough to load up on Olympic scholarships and allow football stars to share in marketing revenue. In terms of competitive balance, yes, it's true some schools are wealthier than others. The University of Texas could easily handle more scholarships. UT-Arlington might not. So what? They aren't meant to be identical. Texas wins nearly every recruiting battle anyway. The idea of limiting "compensation" for the players to balance things out, but not limiting the compensation of coaches and administrators or the size and scope of facilities to lure the best talent in (adding value above the cost of the scholarship) is something only the bosses could believe in. It just shifted the payout model. The construction of top-line facilities is surely appreciated by the players who get to train and play in modern opulence. Here's guessing every one of them would take their old locker in lieu of a full ride. Scholarships limits are wrong to begin with. Let Texas offer 50 per team if it wants. No one limits the number of athletic department employees it can hire or the size of the stadium it can design. No one says the engineering department can only go grant aide to whatever number of students a poorer school can afford. Let the market work itself out. Since this is likely too radical for most, let's agree to this: if there is going to be a cap, however, it should at least be high enough to cover the roster. Would smaller programs struggle to defeat bigger programs as more of the best players flock to the biggest schools? Perhaps, but there is already a recruiting imbalance. Playing time and other factors can still be important. In supposedly protecting the little guy, it's the real little guys – players and their families – who lose out. Thousands of additional scholarships would be well worth the risk, particularly as tuition soars. It's far better than a system where a few kids get full scholarships, some get partials and many get nothing. The interesting part with softball and swimming and other capped sports is that it crushes one of College Sports Inc.'s chief arguments against allowing football and basketball players to get additional pay or a cut of jersey sales or autograph deals. Supposedly a team where "pay" is unequal in favor of star players would cause chaos and require a system impossible to devise. Yet that's exactly how all the other sports on campus operate (not to mention pro team and any company). So which side do college administrators believe? Whatever one limits the rights and remuneration of the athletes in a particular argument, of course. This is how the legislative process views athletes though. Consider another bit of news Wednesday: the mind-numbing decision out of the Big 12 to maintain restrictions on non-scholarship players who wish to transfer within the conference. It goes like this: Let's say you are a volleyball player at Kansas State, but there is no scholarship money for you, so you are paying your own way and excelling on the team. The Kansas coach says he likes you so much he will give you a scholarship. Great. Except you can't just transfer to Kansas. You have to sit out one year and lose a full season of eligibility, essentially cutting your college career from four years to three. In practicality, it makes transferring prohibitive for upperclassmen, the most common walk-ons who develop into good players. So coaches and administrators believe that even students who are paying tens of thousands of dollars to play for them should face a punishment for leaving to go to another conference school that instead values them and is offering to foot the bill. How? Why? What the hell? According to Big 12 commissioner Bob Bowlsby, some coaches didn't want other coaches recruiting players off other rosters, players, mind you, that are so lowly valued they receive no money. So an inconvenience for the coach means more than a hard-working player getting a scholarship. Because college coaches and administrators seem incapable of grasping this, here is the proper reaction to such a situation: Shake the kids hand and say, "Congratulations, I'm very excited for you and your parents. This is great. Thanks for paying to play for us. I wish I had a scholarship to give you, but this makes me happy." Here is the wrong reaction: "We need legislation to limit these kinds of success stories because it is always and forever about us coaches and administrators." Naturally, no coaches or administrators have any problem, or propose any restrictions, on another school (in-conference or otherwise) hiring them at improved compensation. The university can even pay them a million bucks to coach a team that offers just a quarter of the scholarships the roster demands. This is the National Collegiate Athletic Industrial Complex in full effect.